The P & S model metal garage kits for horse barns are fully expandable and customizable with quiet sliding doors and proper ventilation. 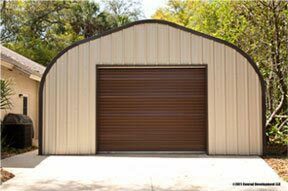 Metal garage kits are perfect for horse barns as they are able to withstand severe climates and are virtually maintenance free. 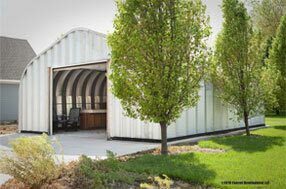 In addition to the much lower cost of traditional wood or brick barns, metal garages are easily expandable and can be customized at any time. Expand your horse stalls and stables by customizing them any way you like with 100% usable interior space with no rafters or beams. 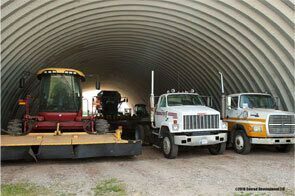 The Metal Building Kings’ quonset hut arch system can be adapted to your specific farming or livestock requirements by increasing efficiency and maximizing your investment. Add windows and the type of entry doors you want including insulated walk through doors and quiet manually operated, insulated sliding doors with heavy gauge steel. You can even custom build your own end walls to give your barn a more traditional look. Choose from a variety of metal building paint colors that match your surrounding buildings. Always allow for wide aisles in between the horse stalls to move equipment and horses through. The best option is asphalt or concrete isles. Horse stalls in the barn should have a gravel base topped with a half foot of clay and rubber pavers for easy cleaning. 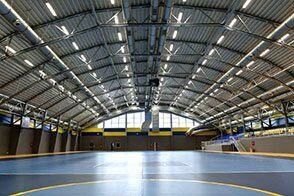 You can design your building up to 100 feet wide to accommodate large horse stalls and wide aisles. Design your barn with ventilation systems for good circulation and skylights for natural light. 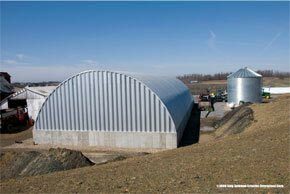 The P & S model arch buildings are widely used for horse stables because of the steel used in the entire barn. 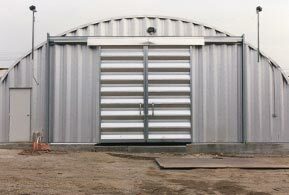 Metal buildings eliminate the issues associated with wood such as rot, rodents, required maintenance and clean up. 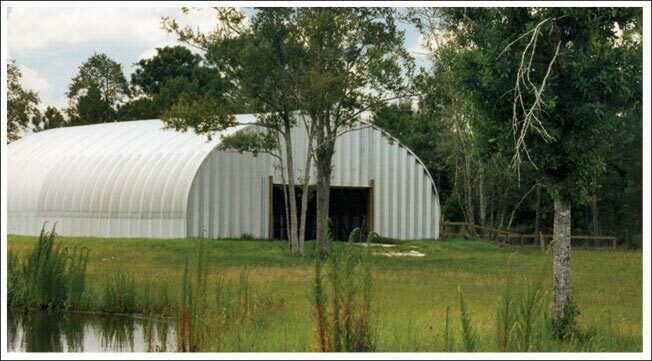 Steel horse barns can be insulated and are far less expensive than a traditional wood frame stable. It is more structurally sound too. Expansion is much easier than traditional wood structures. All you have to do is unbolt the end walls and add more arches to lengthen the space as you need to expand your horse barn. 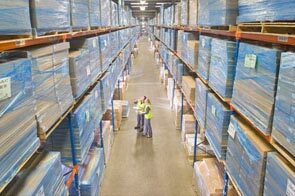 Choose from a variety of widths, heights and lengths and gauges of steel from 14 to 22. 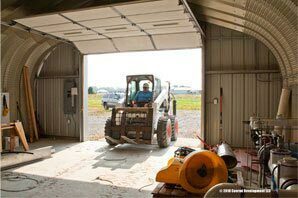 Erecting your steel horse barn requires no special tools and as little as four people to put together in just 4 or 5 days with our easy to follow instruction manual and the assistance from our trained customer service staff. 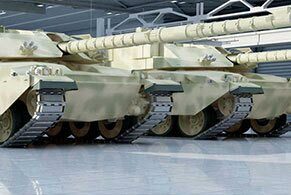 A solid foundation and you are ready to set up your steel stable. Wash downs are easy with ample drainage systems built into the foundation. We offer turnkey solutions to help you with planning and construction to make sure your horse barn or stable is set up to your needs with all the features you want. We have access to the best subcontractors and suppliers in the equine industry. Hook up the necessary utilities to keep the environment comfortable for your livestock. 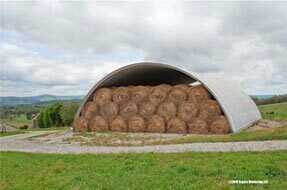 Always angle the entrance at a 45 degree angle so you don’t have a wind tunnel going through the barn on windy days when the doors are left open. Another good idea is to have an entrance on all four sides so you can open doors according to the wind direction on any given day. 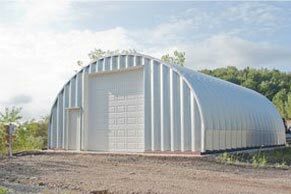 Your Metal Building King arch building is manufactured with 14-22 gauge roll formed 80,000ksi tensile yield carbon AZ55 Galvalume® steel coated with aluminum-zinc alloy and silicon. 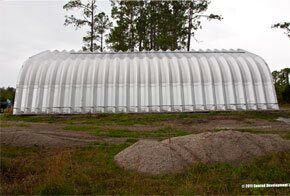 Each steel arch panel has a 7½" deep corrugation engineered to withstand heavy snow loads and hurricane force winds. The paint is the AkzoNobel Ceram-A-Star® 1050, a silicone-protected polyester coil coating system to help prevent rust and comes with an industry best 40 year rust-through perforation warranty and a 40 year warranty. Choose from 6 different colors and several exterior color combinations. Select from 4 different types of metal horse barn models that suits your purposes. The A Model, P Model, S Model and Q Model. Custom design and price your horse barn on our website using our pricing calculator and get an idea how much your horse stable or barn will cost. You can also visit our clearance sale page to see what we have available for sale at deep discounted prices. Visit our discount price calculator to see what we have in stock according to you horse barn specifications that may save you thousands of dollars.